This year’s installment of all things underground, unappreciated and unbeleiveable is bigger and better than ever. 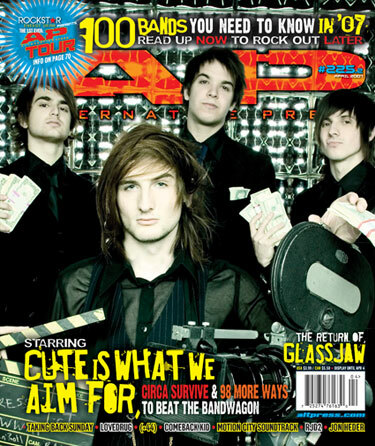 Check it: Not only do you get your choice of collectible covers featuring CIRCA SURVIVE and CUTE IS WHAT WE AIM FOR, we’ve got a free download scheme and our first-ever AP-picked package tour to help turn your passive reading into full-contact sport. All this because we love music-and you! One Punk Under God spokesman Jay Bakker encourages Christians to step up Op-Ed; and everyone from Fear Before The March Of Flames to Rob Crow (and you, of course) tell us if technology is keeping up with us in the AP Poll. We preview albums from Bright Eyes, the Academy Is… and more; and In The Studio spies on Armor For Sleep, the Starting Line and Yellowcard. 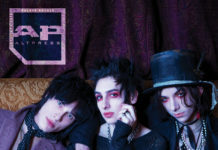 Our AP: DIY section is an exclusive guide for budding musicians, complete with even more exclusive pointers from rockers who’ve been around the block. This month, we get up close and personal with members of Norma Jean, the Academy Is…, (+44), Murder By Death, the Hold Steady and Mute Math, as well as the techs, personal trainers and other experts who keep ’em in shape, musically and otherwise. AP&R introduces you to four unsigned acts you should know; Chalkboard Confessional talks inspiration with Fred Mascherino of Taking Back Sunday; Truth Custom Drums gets the Company Profile treatment; Disclothesure examines the braintrust behind Evil Genius; and Fuse VJ Steven pines over the concerts he almost went to-but didn’t-in his AP-exclusive Untitled Rock Column. Jon Heder skates the light fantastic in Blades Of Glory; Eye Candy becomes a proud member of Air Guitar Nation; and Now Showing checks out what’s new in theaters and DVD players this month. The AP Record Store gives you the scoop on the newest music from Good Charlotte, Big D And The Kids Table, Arcade Fire, Jesse Malin, Big Business, Dälek, Relient K, Air, the Stooges, LCD Soundsystem and more; our In-Store Sessions this month are especially awesome with the Queers, Explosions In The Sky, Comeback Kid, Lovedrug and RJD2; Billy Joel and Boredoms get respectively cannibalized and canonized in our classic-rock and classic-punk columns; plus, scope out Playlist, Collector’s Corner and Listening Station for the best of old and new. Tim Karan is the newest addition to our editorial staff, and we figured it was about time to properly introduce him to our readers. We thought we’d do that by embarrassing the crap out of him-and his CD collection.